America 1957. Eisenhower was the President. Elvis was the King. And Ford Motor Company introduced its new 1957 automobiles, a “new kind of Ford with a touch of tomorrow.” The new Fords were wider, longer, lower, and zippier. Under the hood, the “inner Ford” has been re-engineered: that’s “what put the magic in the new kind of Ford.” To ensure that the visual appearance of the vehicles measured up to their mechanical performance, the cars had been restyled. In addition to snazzy new “sculptured-in-steel” exteriors, Ford offered dazzling new interior trim packages, including this glamorous “Gold Ripplewave” upholstery fabric, a special luxury interior option on the Fairlane 500 Club and Town Victoria. 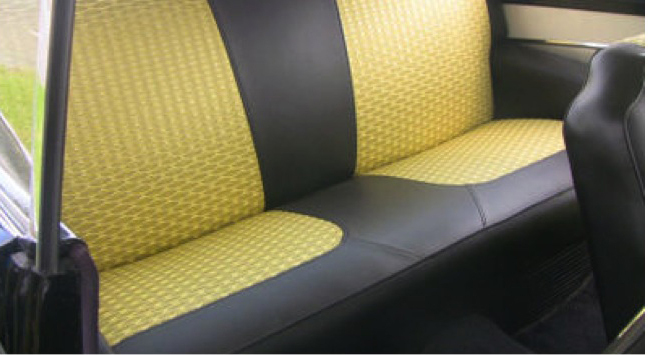 The Gold Ripplewave, with its complex weave pattern, was unique among Ford’s 1957 upholstery options and was offered only in this distinctive yellow and black color combination. Designing handsome, durable automobile fabrics required an understanding of weave structures, synthetic fibers, and power loom production in addition to a sense of style. Ford interior fabrics, like the Gold Ripplewave, not only looked great but were rigorously tested to “prove tensile strength, resistance to wear, resistance to fading, and color ‘fastness’”. The Gold Ripplewave Fabric was manufactured for Ford by the Chatham Manufacturing Company. While the individual designer has not been definitively identified, the Gold Ripplewave pattern is attributed to Marianne Strengell, one of the luminaries of textile design working for the American automobile industry in the 1950s. According to a contemporary magazine account, in 1956 Strengell worked for Chatham, and a large percentage of the automotive fabrics chosen by Ford for its 1957 automobiles were “Strengell-designed and Chatham-woven.” The Gold Ripplewave was likely among them. Gold Ripple-Wave auto upholstery fabric. Designer unknown, for Ford Motor Company. ca. 1956. Museum Purchase from Smithsonian Institution Collections Acquisition Program Fund. 1998-56-1.